The Triangle is a horticultural hot bed. We have weather to garden year round and plant selections to make the new gardener happy and the plant nerd excited. 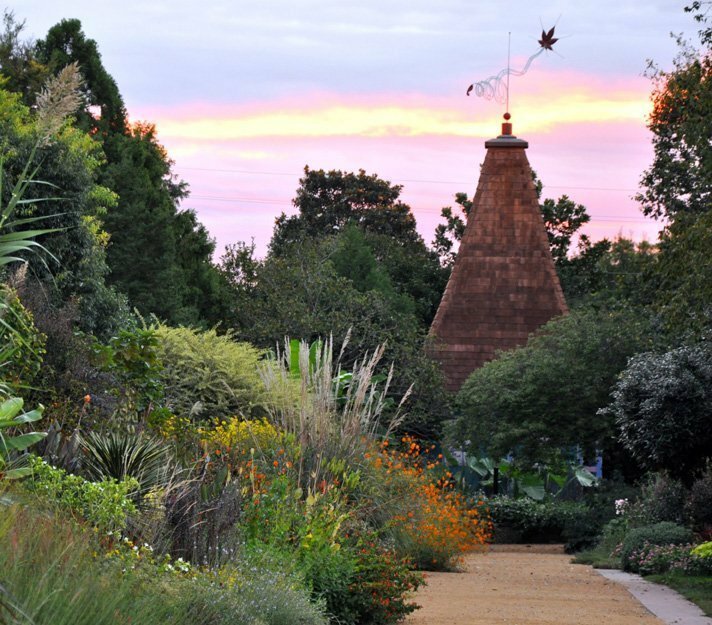 We also have world-class botanical gardens to provide inspiration and ideas as to what can grow in our area. Visitors come to see these gardens from all over the world, and it’s love at first sight. We are a love triangle, plus 1. Have you see what others are raving about: The JC Raulston Arboretum in Raleigh, Sarah P. Duke Gardens in Durham, The North Carolina Botanical Garden in Chapel Hill, and the Cape Fear Botanical Garden in Fayetteville? Each of these gardens is unique and worth a visit. Be sure to inquire about rental facilities, education programs, and volunteer opportunities; it’s a great way to get involved with the local gardening community. The JC Raulston Arboretum sits on 10 acres of land, on the “other side of the tracks” at North Carolina State University. Named in honor of its late director, Dr. J. C. Raulston, the JCRA was founded in 1976 with a mission to introduce, display, and promote plants that diversify the American landscape, as well as provide educational experiences to the general public, students, and the green industry. The JCRA was developed as a living laboratory within the Department of Horticulture Science at NC State University. 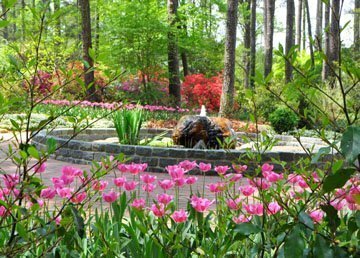 An arboretum the Triangle is fortunate to have, the JC Raulston Arboretum is a nationally acclaimed garden with one of the largest and most diverse collections of landscape plants for home garden use in the Southeast. There are nearly 5,000 different kinds of plants collected from around the world. In short, it’s a research facility; but in reality, it’s a garden to stroll in, alone or with a friend, to study plants, and to get a good feel the diversity of plants we can grow in our area. It’s an exciting place to visit. The JC Raulston Arboretum (4415 Beryl Road, Raleigh, NC) is open every day of the year except for the first Sunday in May when they hold their Gala in the Garden fundraiser. There is no charge for admission or parking. The North Carolina Botanical Garden, part of the University of North Carolina at Chapel Hill, comprises more than 1,000 acres, including 10 acres of display gardens and a number of natural areas. The focus at the garden is to inspire understanding, appreciation, and conservation of plants and to advance a sustainable relationship between people and nature. By setting a conservation example, the North Carolina Botanical Garden also went beyond gardens to include an education center that has received Platinum level LEED (Leadership in Energy and Environmental Design) certification. The display gardens include native plants, an extensive herb garden, fern collection, plus several gardens representative of the diverse regions across the state. 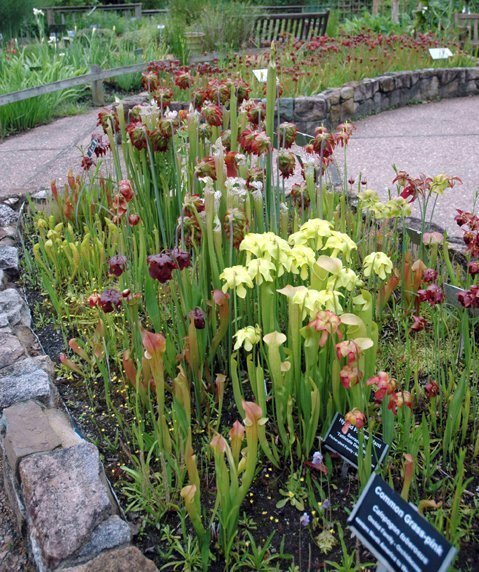 The carnivorous plant collection is known as one of the best in the Southeast. One of my favorite times to visit is during the annual fall sculpture tour, an outdoor exhibition of exciting garden art made by North Carolina artists or those with ties to NC. These sculptures are for sale, and the proceeds help support the arboretum’s ongoing education efforts. The North Carolina Botanical Garden (100 Old Mason Farm Road, Chapel Hill, NC) is open daily year-round, though it is generally closed for Thanksgiving, a week during the winter holidays, and on Martin Luther King Jr. day. There is no admission fee or parking charges. Sarah P. Duke Gardens is the Grande Dame of our area gardens. 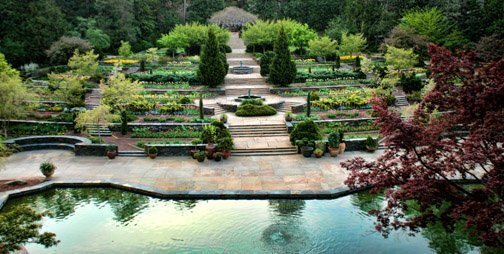 Founded in 1934 on the campus of Duke University (and celebrating the 75th anniversary of its 1939 dedication with events throughout 2014), the Duke Gardens has recently been named one of the top 10 public gardens in the United States. This distinction is well deserved, and a crowning moment for the Triangle area as a whole. One visit and you can see why this garden received such a distinction. The garden promotes knowledge of the connections between people and plants, fostering an appreciation of the natural world, environmental awareness and sustainable practices. A great strolling garden that features four distinct gardens, each with its own focus and flavor: the Historic Garden, including the popular Terrace Gardens, dedicated in 1939; the H.L. Blomquist Garden of Native Plants, a representation of the flora of the southeastern United States; the W.L. Culbertson Asiatic Arboretum, devoted to plants of eastern Asia; and the Doris Duke Center Gardens, including the new Charlotte Brody Discovery Garden. Pack a lunch and spend the day. There are five miles of allées, walks, and pathways throughout the gardens, and many shaded benches. There are also rolling hills and open areas to lay a blanket and read a book. Sarah P. Duke Gardens (420 Anderson St, Durham, NC) is open 365 days a year. Admission is free, but Duke University charges $1 per half-hour for parking. I’ve been in Raleigh just a little longer than this garden has been in existence, and I am embarrassed to admit this, but before this story assignment, I’d only half-hardily visited Cape Fear Botanical Garden on a cold January day several years ago. Just recently I visited this garden again (in the fall), and had no idea so much was going on! Cape Fear Botanical Garden is within an easy day-trip-reach, and since my early fall visit, I’ve been back twice! Who knew? Founded in 1989 with a mission of enrichment, inspiration and enjoyment of nature, the garden now boasts more than 2,000 varieties of ornamental plants and it has several specialty gardens, including camellia, daylily, and hosta gardens. If you haven’t been lately, there is a new visitors center—The Wyatt Visitors Pavilion Complex—designed to open wide from the veranda for a full view into the gardens beyond. I stood on the veranda to take in the view. Breathtaking. There is a beautiful arbor leading into the cultivated gardens towards a fountain and shade garden. The gardens were comfortably toured within two hours with time left over to go downtown Fayetteville for lunch. Cape Fear Botanical Garden (536 N. Eastern Blvd, Fayetteville, NC) is located on 78 acres nestled between the Cape Fear River and Cross Creek. The garden is open daily, except Thanksgiving Day, Christmas Eve, Christmas Day and New Year’s Day. Hours may change during holidays and inclement weather. Admission is charged.